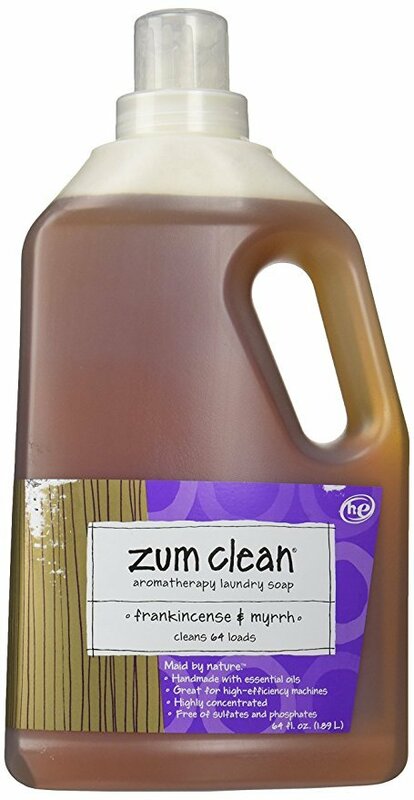 Indigo Wild Zum Clean Laundry Soap looks like a super natural detergent. However, there is some confusion as to whether the product has changed recently or not. Many returning customers have posted many complaints about the change in the product. That being said, Indigo Wild Zum Clean Laundry Soap still has a 4.4 star rating on Amazon, and carries the Amazon's Choice badge. So what is with this detergent? Looking at this, Indigo Wild Zum Clean Laundry Soap looks very simple. But I think that is the idea. Indigo Wild is a brand that focuses on the most natural clean you can get. They do that by only using natural ingredients and absolutely no chemicals or synthetic ingredients. Instead focusing on the powers of essential oils. Honestly, the detergent looks like dirty hand soap, rather than a laundry detergent. It comes in a transparent bottle, which is nice to see, but also a bit off putting. Nevertheless, the ingredients contained in Indigo Wild Zum Clean Laundry Soap are great quality and seemingly effective. The selling point for Indigo Wild Zum Clean Laundry Soap is their ingredients. There is absolutely nothing in here that is not natural. In addition, they list what every ingredient does, right on the back label, which is always awesome to see. The complete list of ingredients is rather small, but that is because there are no fillers and only contains what is necessary. Potassium cocoate (saponified 100% coconut oil), sodium bicarbonate (baking soda), fragrance (essential oils), and glycerin (derived from vegetables). This is the most natural detergent product money can buy. If it were any more natural, you'd be washing your clothes in a stream behind your house with pure oils and baking soda. While a scent is not particularly needed when it comes to laundry detergents, it is definitely welcome. Many people believe that if your clothes do not come out smelling like flowers or citrus, that means they are not clean. This is not true in the least, but because it has been ingrained in our minds for so long, it is still a good idea to use a fragrance in your detergent, from a business standpoint. So, Indigo Wild Zum Clean Laundry Soap does include a scent, but it is not particularly strong. The best thing about this detergent is that it is completely free of any and all chemicals. Indigo Wild Zum Clean Laundry Soap contains no phosphate, chlorine, ammonia, petroleum solvents, butyl, glycol ether, brighteners, SLES, SLS, or EDTA. When it comes to buying detergent, money is a big factor. Indigo Wild Zum Clean Laundry Soap is not entirely cheap, but it is not overly expensive either. You will be paying slightly more for this detergent than you would for another brand, but this is because the ingredients used here are highly concentrated and 100% natural, which means they are also expensive to use. Indigo Wild Zum Clean Laundry Soap seems to have a pretty solid fan base. However, recent customers have begun to notice changes to the product. A few have sent in pictures and have even compared it with a store bought version of the same product. The general consensus is that the online product is very much diluted. People have mentioned the detergent being of a lighter color than the product page. In addition, the scent has also diminished as well, from past orders. Whatever Indigo Wild did is obviously affecting their product negatively. That, or these customers bought from a 3rd party. In which case, all bets are off and you just have to pray that you are getting the same product. Grab Green Natural 3-in-1 Laundry Detergent is designed to get the cleanest clothes possible with having the smallest impact on the environment. There are no chemicals, no synthetic ingredients. Oh, and it actually works as well. So there is no need to worry about any potential side effects for your health or the environment in any way. Indigo Wild is a rather hippie organization. True flower children work here. Their goal is to provide quality products that are free from all of the toxic additives that are in the regular products people are constantly using. Indigo Wild only uses natural ingredients in all of their products. Speaking of which, their product line is huge. They have products available from goat's milk soap bars, all the way to soy candles and body mists. All made with the same quality ingredients. Indigo Wild Zum Clean Laundry Soap is natural and biodegradable. You won’t be adding harmful chemicals to the environment or your septic tank. If you are looking for a trustworthy brand with nothing to hide, look no further than Indigo Wild Zum Clean Laundry Soap. Their ingredients list is small and their unique roles are laid out for you. In terms of safe, this is the creme de la creme. Everything in Indigo Wild Zum Clean Laundry Soap is natural and safe for use in clothes and the environment. It seems that a change in something at Indigo Wild has resulted in the diluting of their laundry soaps. No idea what or why it was changed, but many people are unhappy with the change. When it comes to changing a formula, not everyone is going to be on board at first. However, with Indigo Wild Zum Clean Laundry Soap, it seems that the change has actually negatively affected their star product. And unless that is fixed, and soon, they might find a big loss in their customer base and their overall sales. Either way, if you can find an old formula, or find it in your grocery store, it seems that is the better way to go, than buying it online. Overall, Indigo Wild Zum Clean Laundry Soap is a great brand that gets the job done without any harsh or toxic chemicals you have to worry about. While buying it online may result in you getting a diluted detergent, finding it in a store should not be hard to do. If you want to give this product a try for yourself, you can grab a bag on Amazon for $23.42. For more information, including the best natural laundry detergent, check out the rest of Green and Growing. Here are some top questions that I found for people seriously considering buying the Indigo Wild Zum Clean Laundry Soap. Is the fragrance synthetic? No, it is made using essential oils.